Toyota Avanza…whoa, oh dear, I never thought I’d say that. You see, I’ve driven a variety of German cars for over twenty years. They build cars as they make techno; elegantly, with supreme precision and extract a beauty from that precision that no-one else can approach. The BMW three series is still the finest production car bar none and a beautifully kept late eighties 325 is a thing of much wonder. It has an atheistic that something like a Lexus can’t ever aspire too. And so it is a very strange place to be in, in mid 2006, writing with joy about a cheap faceless Japanese box, with such pleasure. But, if being in Bali has done one thing, it’s removed the material urges a little and replaced them with a new sense of reality. And that reality is also reinforced by the fact that for the past twelve months I’ve been driving the Indonesian equivalent of the Ford Model T, the ubiquitous and necessarily rugged, Toyota Kijang. As I taught myself to drive all over again, as one needs to if you are to navigate the unregulated mayhem on the roads, I understood what it was like to exist on appalling roads in a car with at best rudimentary suspension. And no bloody sound system. No bloody sound system. I endured it because it made sense to do so. But no longer. I have suspension and a reasonably good car stereo and I’m happy, happy, happy and I love the soulless little beast, although, in a perverse way now I miss the blue Kijang. My bum had become so accustomed to the way it ricocheted off every corner of a pothole, it felt like family. I hope whoever has it now, gets the same education from it I did. As an aside this is also the first time I’ve experienced the decidedly un-western feeling of selling a car for the same as I paid for it a year earlier. Kites….the last real drive I took DK1690XY (for that was the Kijang) on was down to the northern end of our rather beautiful Sanur Beach. Its a place I see far too rarely…is a funny thing, you move to paradise and yet sometimes you get so very complacent and let it slip right past you. But here we were, for the semi final of the annual kite completions. 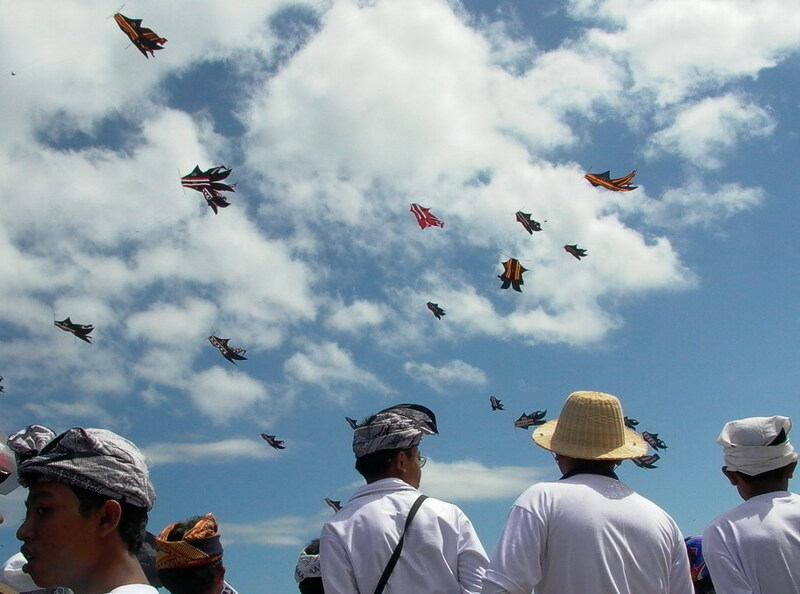 A defining feature of this island during the dry season are the literally hundreds of kites, from the small ones flown by local boys, to the massive, perhaps fifty metre long ones, flown by villages and banjars. These dominate our skies and they come together in July and August for a competition, the semi final of which was on our beach. There were, I was told, about 50,000 people present, but it felt like more, all gathered in community groups, complete with catering, taking turns to take their particular creation into the blue against others in their category. And there were flags and colour and banners and more flags and immense waving swathes of cloth in the wind. 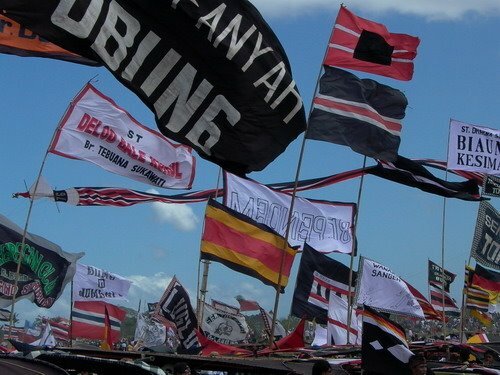 The Indonesians love flags…. Flags…and they have quite a good one too. The simple red and white one is such a recognisably strong banner, and right now its everywhere. I didn’t know (and why would I) until I came here that the flag was symbolically created as a defiant gesture of independence when someone tore the blue stripe off the oppressing Dutch flag in 1945. And so it is that on the anniversary of that hard won independence, every August 17, for a couple of weeks before, this country is almost literally covered in red and white fabric. Cars, buildings, trees, businesses and just about everything that moves or doesn’t gets the patriotic sash or flag. I’m a New Zealander, and try as we might, we don’t have a massive flag bound patriotic thing going on. Our flag is a nothing for a start, But we also don’t like the exhibitionism thing that such blatant national pride demands. And yet when I hear Andrew White’s quite dramatic and very moving That Lange Track, I get a patriotic shiver, I can’t help. But that said, I have a problem with patriotism. The line between it and nationalism is too thin to make me comfortable. However, there is something about the national pride that you see here in Indonesia that works. This isn’t the ugly patriotism of the USA, a pride that has long since passed its use by date and has a rotten aura about it. This instead is a pride, like that of the US a long, long time ago, about what the nation was created from and how that creation came about. It’s a benign patriotism, and I’m enjoying the fluttering everywhere, quite a lot.